Heastie joined Assemblymember Christine Pellegrino to continue his annual statewide tour in Long Island. Long Island, NY - August 2, 2018 - Assembly Speaker Carl Heastie today joined Assemblymember Christine Pellegrino to continue his annual statewide tour in Long Island. The pair visited a local community counseling center, as well as an area along the south shore that is still struggling in the aftermath of Superstorm Sandy. 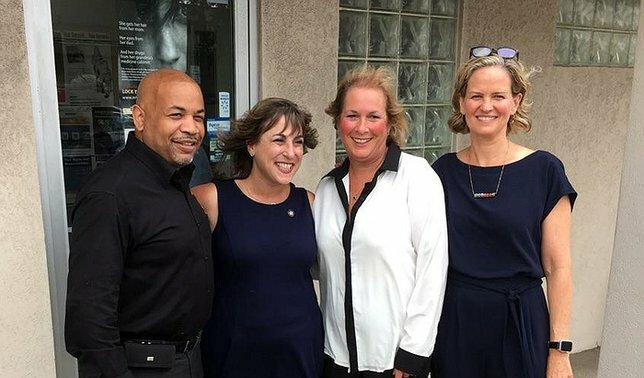 Speaker Heastie and Assemblymember Pellegrino first stopped at YES Community Counseling Center, a local nonprofit that helps community members in southeastern Nassau County overcome issues that include domestic violence, substance use and addiction, family conflict, sexual abuse, marital/peer difficulties, suicide and loss, bereavement and other important issues. YES also provides social work services to Massapequa elementary students through their partnership with the schools. The organization works tirelessly to address issues related to the nation’s heroin and opioid epidemic. In the 2018 budget, Assemblymember Pellegrino was able to secure $50,000 for the Center’s Family Life Support Project. Subject: LongIsland.com - Your Name sent you Article details of "NYS Assembly Speaker Heastie Visits Long Island's South Shore"